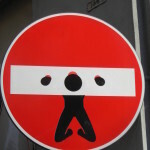 Many people visiting Florence stop quizzically to look at some strange road signs scattered around the city. 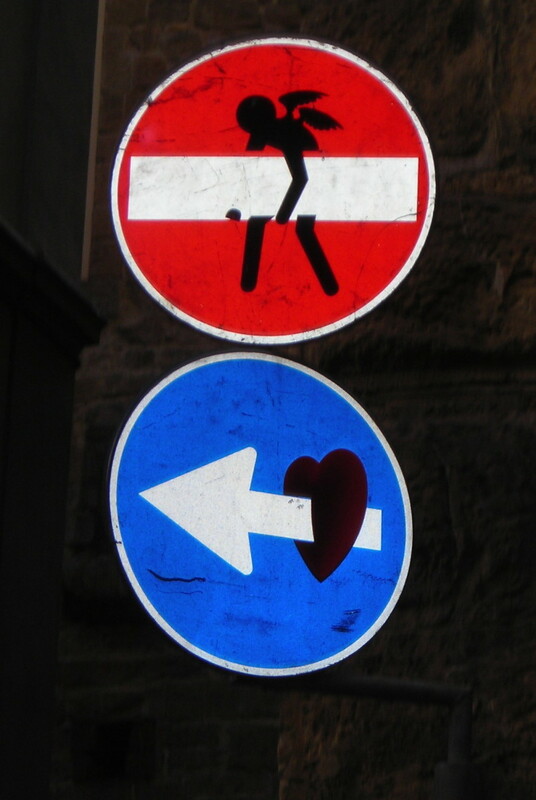 Pass on arrows running into hearts, no way signs transformed into a pillory or heavy weights, dead end becoming a crucifixion. Clet Abraham was born and raised in France where he studied art, but moved to Florence in 2005. His artistic idea originates from the wish to think, and force us to think, about the images we see every day. Clet noticed how road signs are especially redundant and invasive. This thought led him to act to try to contradict the formal message in the sign and offer new perspectives from a spiritual, intellectual or just funny point of view. 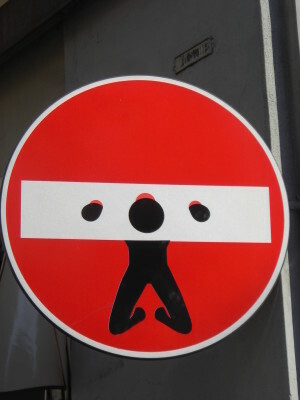 He also underlines that his stickers can easily be removed and do not damage anything, marking the difference from street and graffiti artists. Although he has sometimes been fined he kept on in the name of artistic freedom. 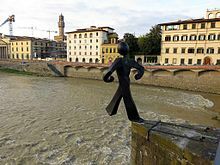 One of Clet’s most successful interventions was the statue of the Ordinary Man, installed at Ponte alle Grazie in January 2011 : a fiberglass human figure, natural size, leaning from the bridge and stepping forward. He said the Ordinary man should be interpreted as an incentive to move forward even when it is risky. The statue embodies those moments in which we have to make a decision and take a step. It was also a provocation: the Ordinary Man was set in place overnight without permission and was quickly removed by the police. Clet declared the statue was his personal step forward to question the local authorities about the state of contemporary art in Florence. Its removal was perceived as a confirm of the immobility of the city….let’s wait and see what comes next!